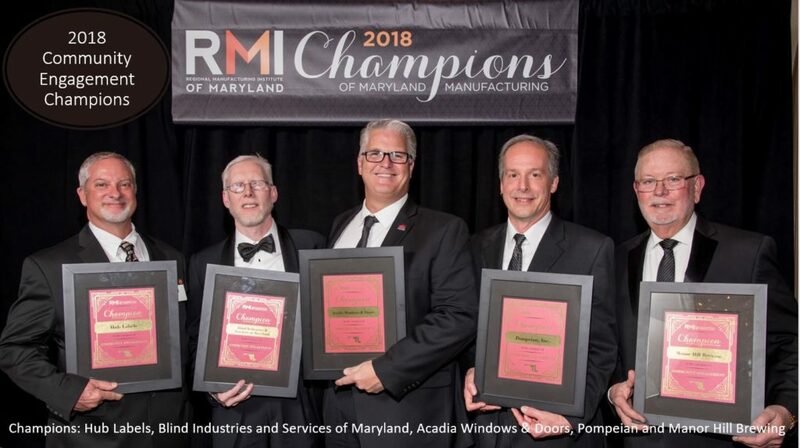 Baltimore County’s Acadia Windows & Doors helps support nearly 100 Greater Baltimore Area families – employing individuals with differing abilities, supports job placement, and helps spouses and children of those disabled or deceased while serving our country. Blind Industries and Services of Maryland is Maryland’s largest employer of blind people and operates fabric cutting and sewing facilities in Baltimore, Cumberland and two in Salisbury. Washington County’s Hub Labels encourages employees to be active in the community, and they have responded impressively, supporting more than a dozen benevolent organizations through fundraisers and volunteer hours. Howard County’s Manor Hill Brewing has raised over$3 million for Howard County charities and other nonprofits. Baltimore City’s Pompeian has pledged to donate $1 million to the City of Baltimore. The company teaches local students, the basics of health and nutrition, and providing an opportunity to visit their facility learn about business and various career paths.